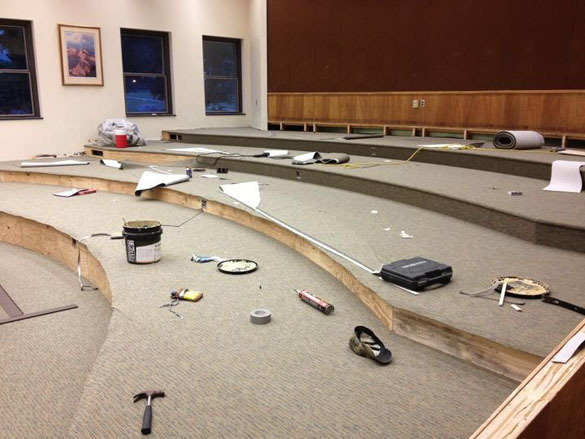 Our beloved Scovel Hall lecture rooms are finally being updated. 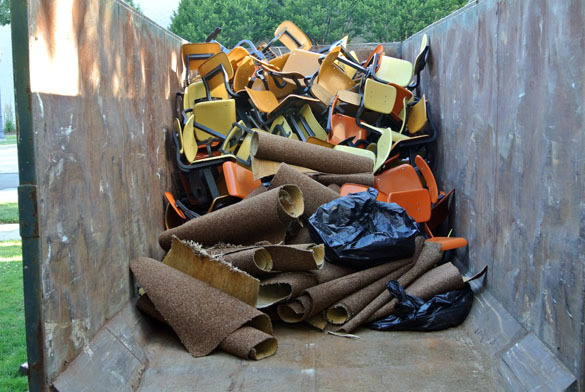 The fixed seats in Room 105 endured by generations of student behinds are headed to the dumpster (including their 1985 color scheme) and will be replaced by tables and movable chairs. Seating capacity will go from the huge 83 to a more comfortable 50. The more flexible seating will allow us to move around more in the classroom. Scovel 205 upstairs is also being redone in a similar way. I’ve taught in the present arrangement for 27 years. I’m anxious to teach in the new improved rooms! 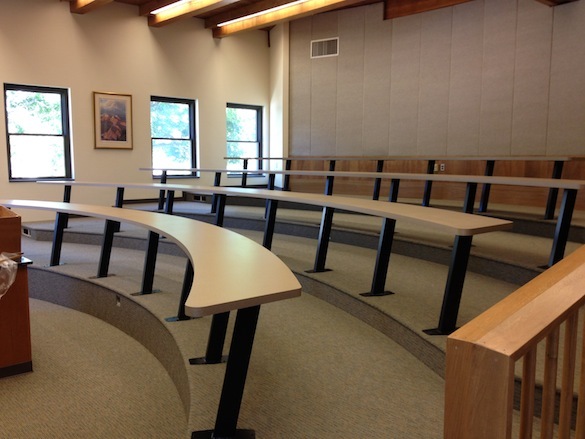 Scovel Room 105 on June 6th with all seats removed. 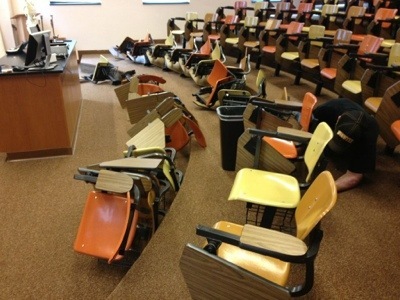 Where those chairs and the carpet ended up! 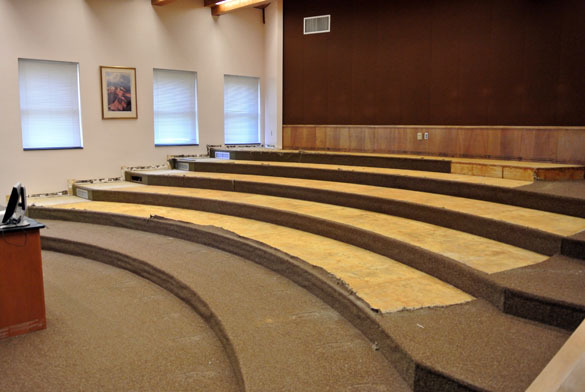 The new carpet in Scovel 105 on July 31. Scovel 105 in early August 2012. Sure it is intellectually stimulating, adventurous and fun, but geology is also an important field for the present and future according to the latest issue of Forbes magazine. Geology is ranked as number 7 in the most valuable college majors, with a starting median pay of $45,300 and a “mid-career” rise in pay of 84%. The projected job growth in geology is 19.3%. Top image: Rob McConnell and Palmer Shonk in Estonia. Bottom image: Sophie Lehmann in England. Steve Dornbos (’97), now a professor at the University of Wisconsin, Milwaukee, and I found these intricate shells by the hundreds in the Nicosia Formation (Pliocene) of Cyprus during his Independent Study field work. (We published this study in 1999.) 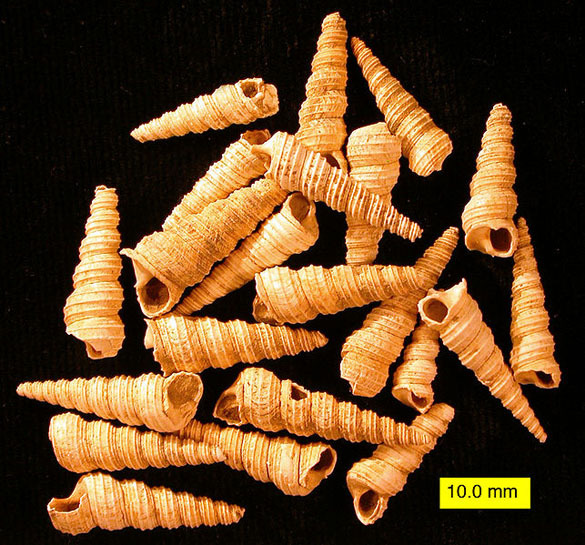 They are the gastropod (snail) species Turritella tricarinata (Brocchi 1814). Turritellid snails are still very common today, so we know quite a lot about their ecology and physiology. They are an unusual mix of deposit-feeder and filter-feeder, eating organic particles on the sediment surface and in the water. They do it by creating a current with cilia, drawing water into their mantle cavities. There they have a complex system of tentacles that filter out the largest particles, allowing only the small, digestible goodies onto the surfaces of their gills. The organics are coated with mucus and made into a kind of sticky string that is pulled into the mouth (Graham, 1938). These snails are usually found in large aggregations, just like what we found in the Pliocene of Cyprus. 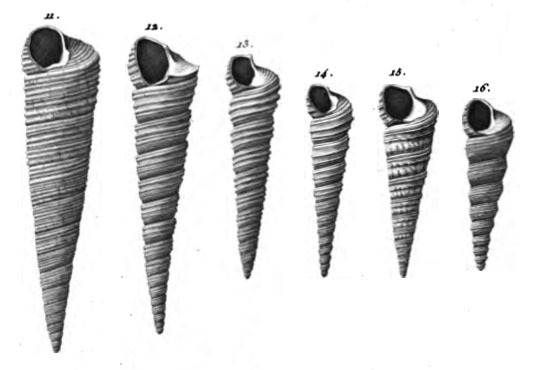 Turritella tricarinata was originally described by Giovanni Battista Brocchi in 1814 as Turbo tricarinata. Brocchi (1772-1826) was an Italian natural historian who made significant contributions to botany, paleontology, mineralogy and general geology. He was born in Bassano del Grappa, Italy, and studied law at the University of Padova. He liked mineralogy and plants much better than lawyering, though, and became a professor in Brescia. His work resulted in an appointment as Inspector of Mines in the new kingdom of Italy. Brocchi wrote the first thorough geological assessment of the Apennine Mountains, and he included in it a remarkable systematic study of Neogene fossils. He compared these fossils to modern animals in the Mediterranean — a very progressive thing to do at the time. Above are drawings made by Brocchi of the turritellid fossils he found in the Apennines during his extensive study published in 1814. Note that in the Continental fashion still followed today, the shells are figured aperture-up. Americans and the rest of the English-speaking world orient them in the proper way. Brocchi was an adventurous traveler, but it eventually did him in. 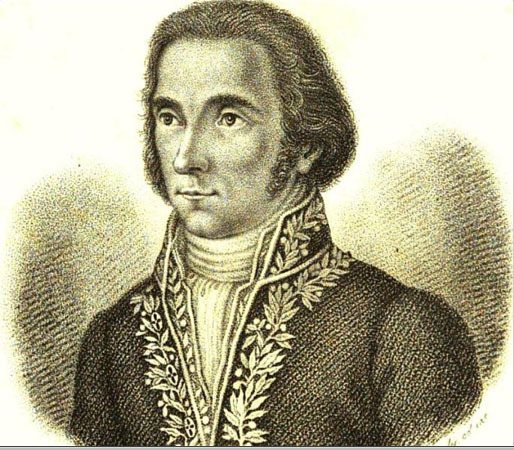 He died in Khartoum in 1826, a “victim of the climate” and a martyr for field science. Brocchi, G.B. 1814. Conchiologia fossile subapennina con osservazioni geologiche sugli Apennini e sul suolo adiacente. Milano Vol. I: pp. LXXX + 56 + 240; Vol. II, p. 241-712, pl. 1-16. Graham, A. 1938. On a ciliary process of food-collecting in the gastropod Turritella communis Risso. Proceedings of the Zoological Society of London A108: 453–463. 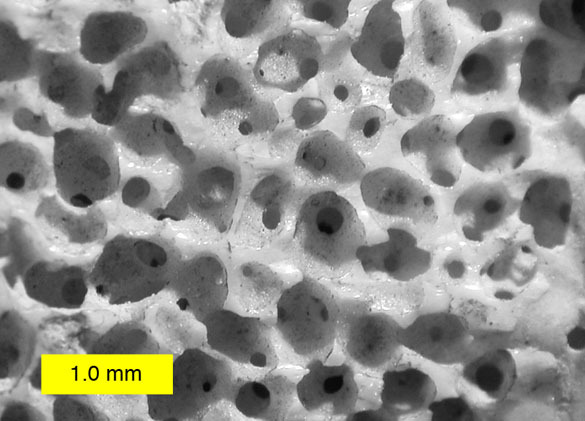 The most effective agents of marine bioerosion today are among the simplest of animals: clionaid sponges. 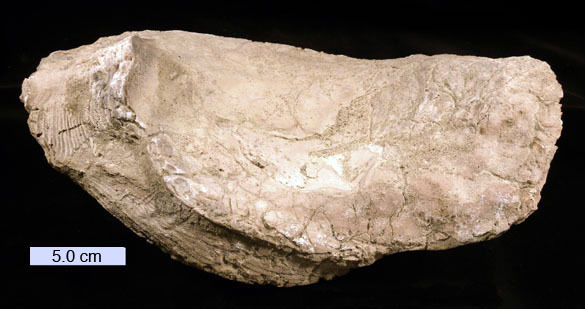 The traces they make in carbonate substrates are spherical chambers connected by short tunnels, as shown above in a modern example excavated in an oyster shell. The ichnogenus thus created is known as Entobia Bronn, 1838. 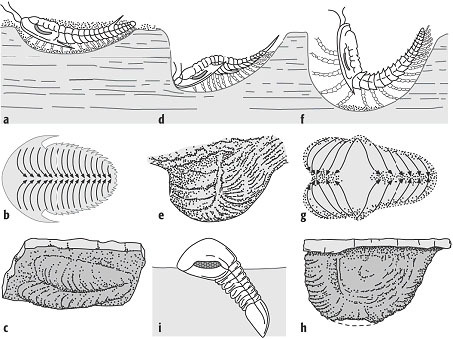 I’ve become quite familiar with Entobia throughout its range from the Jurassic through the Recent (with an interesting early appearance in the Devonian; see Tapanila, 2006). 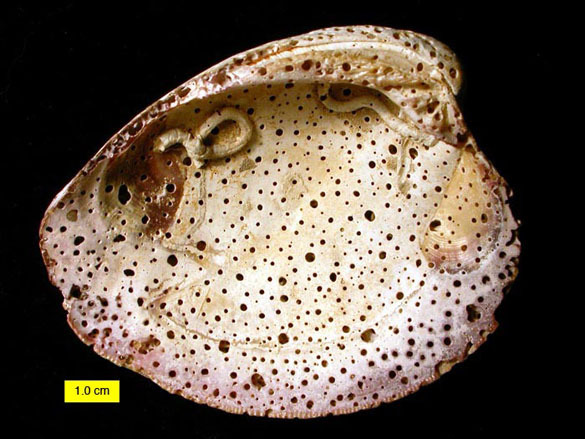 This is a modern clam shell showing Entobia and several other hard substrate dwelling organisms (sclerobionts). Entobia was named and first described by Heinrich Georg Bronn (1800-1862), a German geologist and paleontologist. He had a doctoral degree from the University of Heidelberg, where he then taught as a professor of natural history until his death. He was a visionary scientist who had some interesting pre-Darwinian ideas about life’s history. Bronn, H.G. 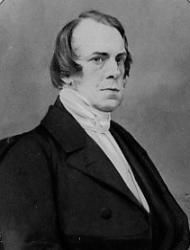 1834-1838. Letkaea Geognostica (2 vols., Stuttgart). This semester, I’ve had the pleasure of teaching a special topics lab course in geochemistry. Given our new lab facilities, I decided to approach the class as an analytical geochemistry course. We explored sampling strategies, data quality, and the theory and techniques behind X-ray methods (XRF), electron-beam methods (SEM-EDS), and mass spectroscopy methods (ICP-MS). Unlike a typical survey course, our course was entirely research-based. We actually became analytical geochemists by conducting an authentic research project on a suite of Icelandic basalts. Our goal was to investigate the development of a structural basin in northern Iceland by interpreting the petrogenesis of lavas that were erupted during different phases of basin construction. This week, we’ve accomplished our goal and have written an abstract to submit to the Fall 2012 meeting of GSA. Vatnsdalfjall, in northwest Iceland, exposes the upper ~700 m of crust formed ~7 Ma ago at the extinct Hunafloi-Skagi rift zone. In general, the lava flows dip gently westward toward the abandoned rift axis, but are interrupted by a local area of steeply dipping lava flows known as the Vatnsdalur Structural Basin (VSB). The VSB is composed of three sequences of lava flows emplaced before, during, and after subsidence. Using the geochemistry (XRF, ICP-MS) of samples gathered in the field in 2006 and 2007 and previous data from Ackerly (2004) and McClanahan (2004), we were able to establish a basic eruptive history for the sequences. Major element analysis shows diverse rock types, including basalt, basaltic andesite, dacite, and rhyolite. 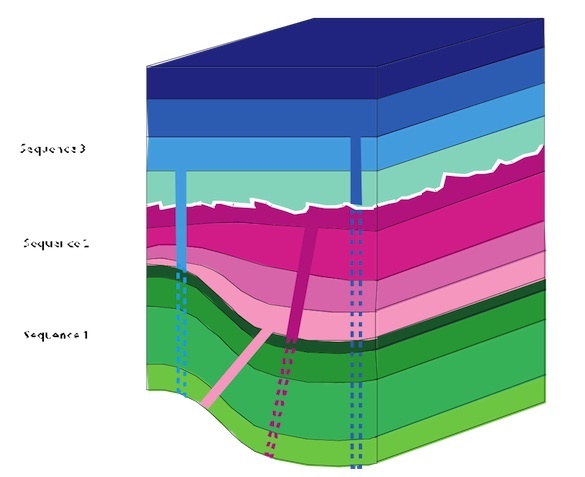 Sequence 1 shows the greatest diversity and was primarily affected by mineral accumulation, while Sequences 2, 3, and the dikes follow the trend of a shallow level fractional crystallization model based on a modified parent magma from Sequence 1. Trace element ratios suggest the presence of 1 (or 2) parent magmas, although the intermediate to silicic lavas appear to be generated by a separate process. Sequence 1 contains various lava flows, each with a uniform thickness, emplaced on relatively flat terrain. Sequence 2 was emplaced on top of Sequence 1 as subsidence of the basin was occurring, creating lava flows that thicken toward the basin interior. Intermediate to silicic rocks are absent during this interval and dikes cut Sequence 1 to feed lavas in Sequence 2. After a period of erosion, Sequence 3 was erupted above Sequence 2. Dikes that feed Sequence 3 cut through Sequence 2. The development of the VSB may have been associated with a waning period in the magmatic system, where magmas cooled and evolved (following an evolutionary trend controlled by fractional crystallization) and there was little partial melting of the crust (given the lack of intermediate to silicic lavas). 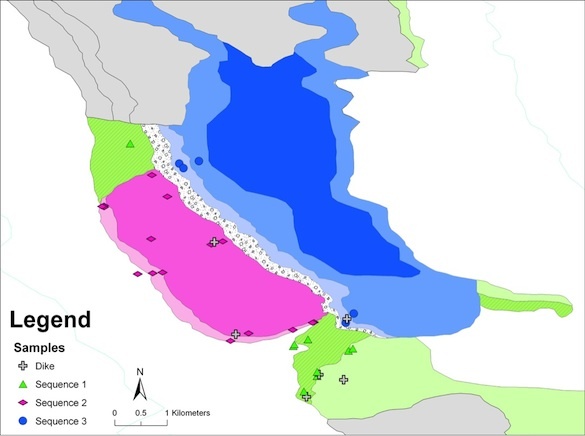 Geologic map that shows the location of our samples on Sequence 1 (green), Sequence 2 (pink), and Sequence 3 (blue). CaO vs. MgO (wt%). Symbols for dikes and Sequences 1, 2, and 3 are as shown on the geologic map. Previous data outlined by the dashed line. Fractional crystallization model shown by the black like. 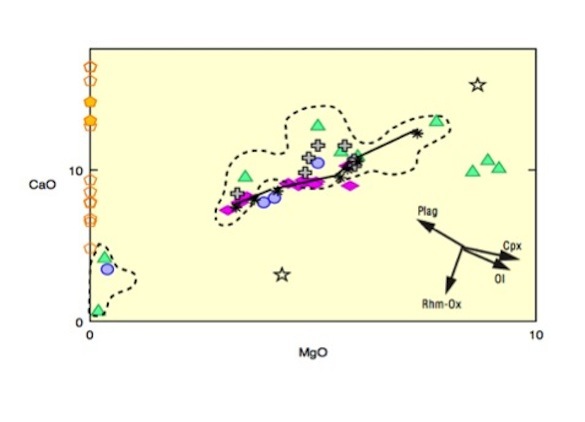 Arrows indicate effects of mineral accumulation. Plagioclase (pentagons) and clinopyroxene (stars) are also shown. Schematic model (not to scale) for the development of the basin. I applaud all of the students for their excellent work. They really took ownership of this project and deserve all of the credit. Look for us at GSA in the fall! WASHINGTON, D.C. – Guest blogger: Lindsey Bowman (’12). 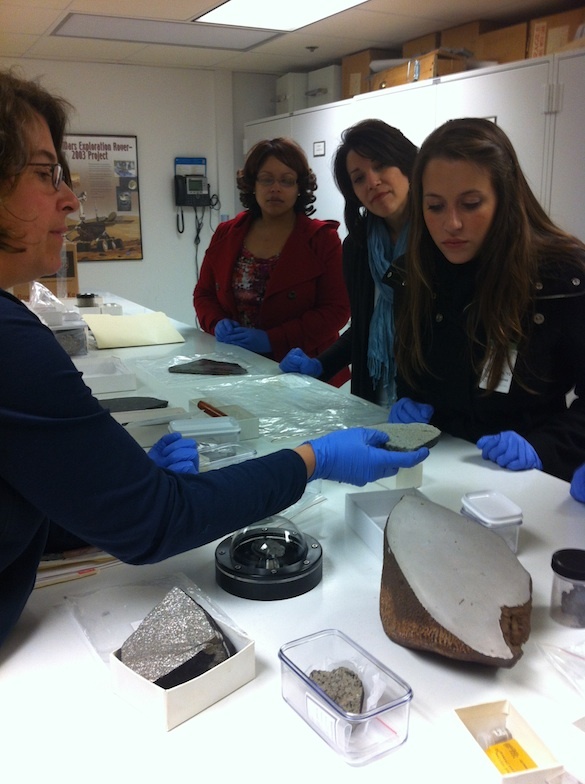 As part of CUR’s Posters on the Hill event, we took a behind-the-scenes tour of the U.S. National Meteorite Collection at the Smithsonian. Our host was Dr. Cari Corrigan. Dr. Corrigan showed us meteorites from the asteroid belt. This is an Fe-Ni meteorite. 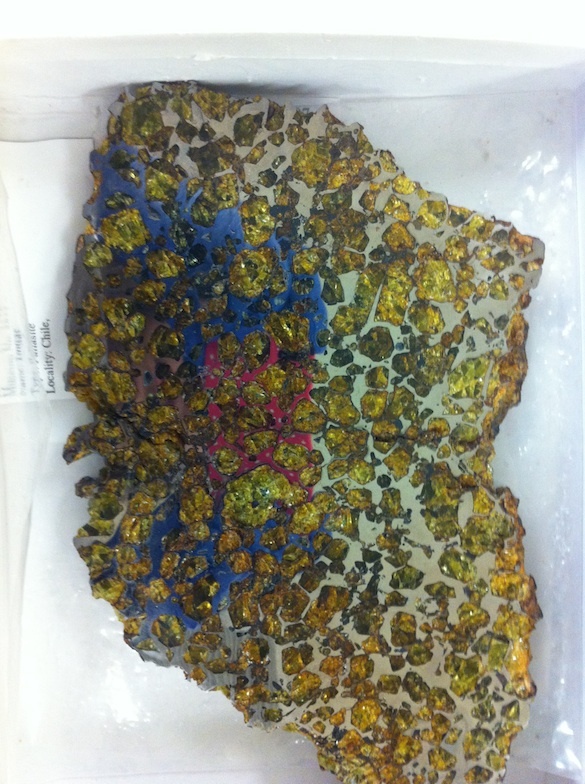 The pink and blue colors are a reflection, but the green areas are olivine crystals. 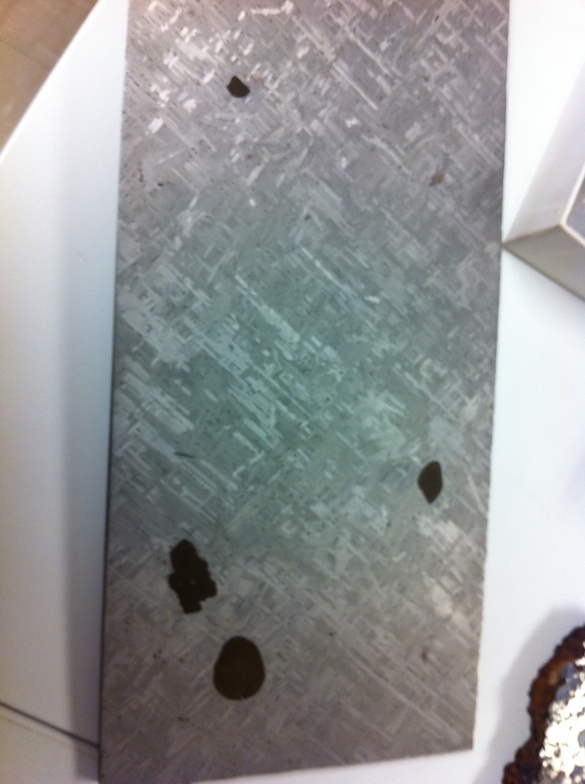 This core of an iron meteorite has been etched with nitric acid to reveal the widmanstatten pattern. 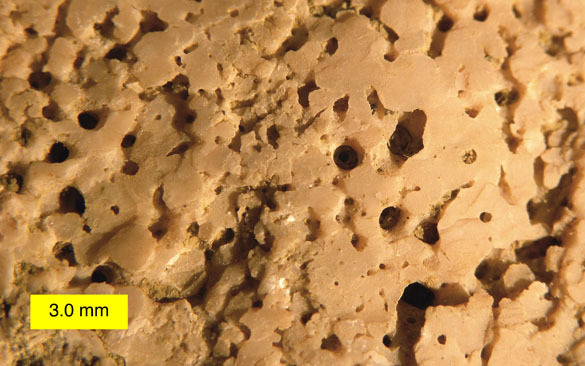 The dark spots are iron sulfide inclusions. 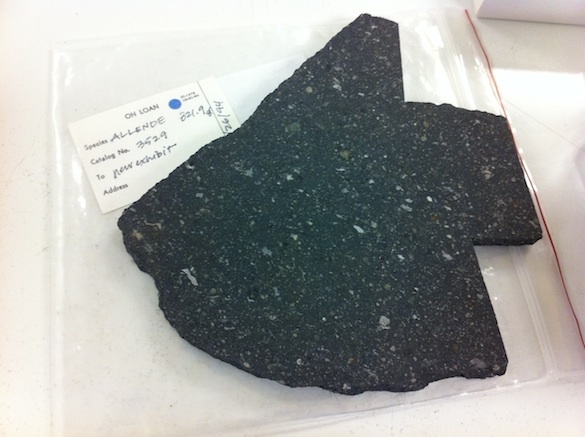 This is the famous Allende carbonaceous chondrite. 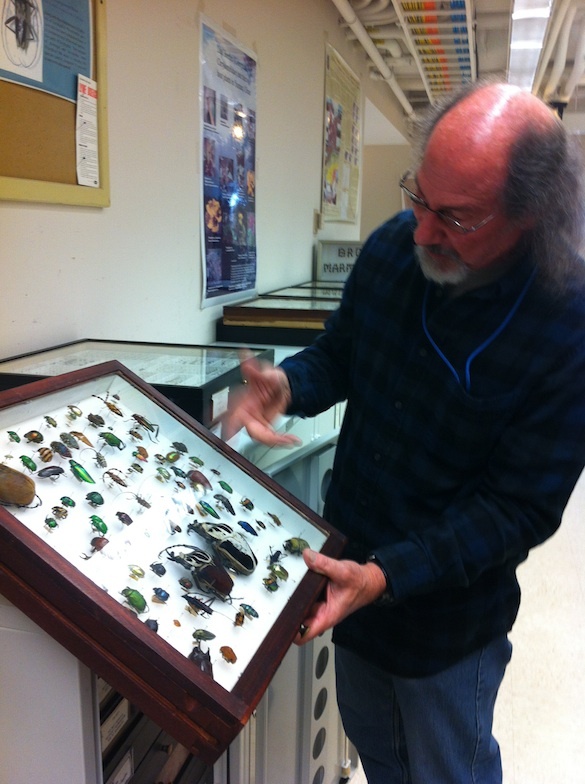 Next, we toured the Entomology Collections with USDA Entomologist Dr. John Brown, whose specialty is Lepidoptera (moths and butterflies). We started on the 7th floor of the building at a cabinet labeled "Oh My!" where he showed us jaw-dropping, giant, colorful bugs. Dr. Brown then took us to the "ugly little brown moths" that are the focus of his research. They feed on kiwi and avocado crops. 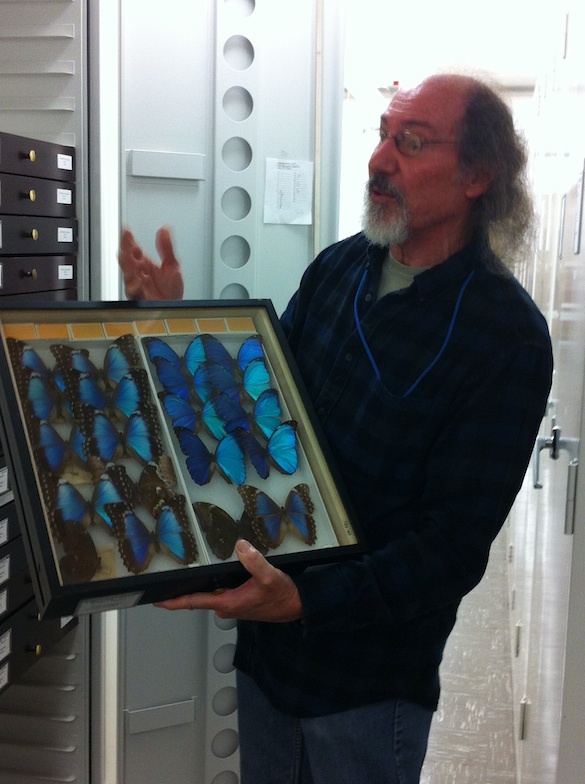 Finally, Dr. Brown showed us bright blue butterflies. The color of these butterflies won't fade over time because it's a structural optical feature of their wings. WASHINGTON, D.C. – Students and faculty aren’t the only audiences for Wooster I.S. presentations. 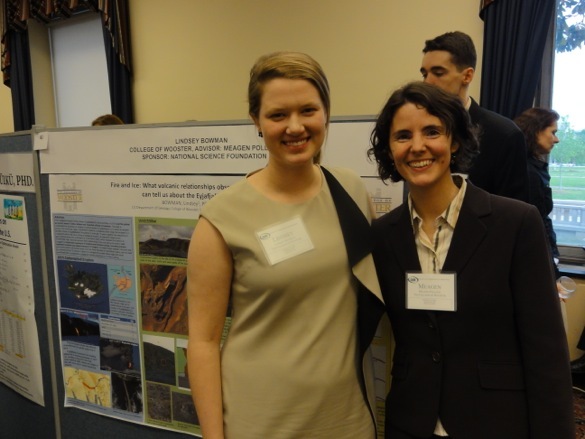 This year, two Wooster students were selected (out of 850 applicants) to represent the best in undergraduate research at CUR’s Posters on the Hill event. Congratulations to Lindsey Bowman (’12) and Nikolai Radzinski (’13) on their accomplishment! Be sure to check out the press release to hear about their experiences in their own words. 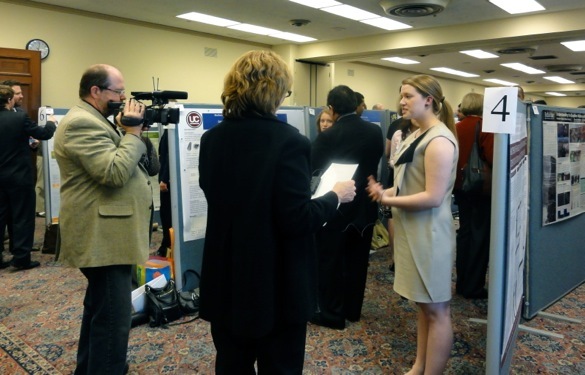 Lindsey's research took center stage as she was interviewed by the camera crew. Lindsey presented her I.S. research on subglacial eruptions. 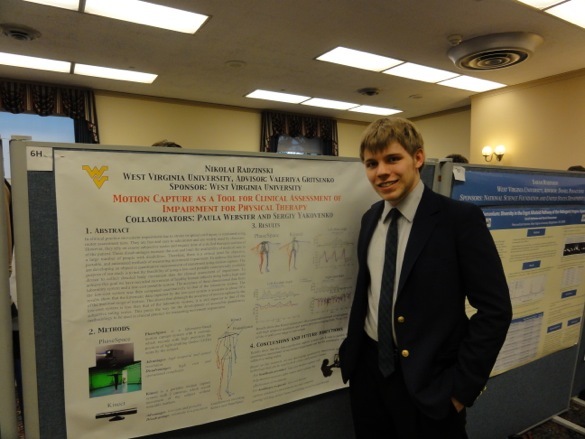 Nikolai, a junior biochemistry major, presented his summer research on measuring motor function loss for brain injury victims. This presentation is the first of three that these students will give to the department about their projects. It is always the most difficult because the research is just beginning and the students are new to giving talks. 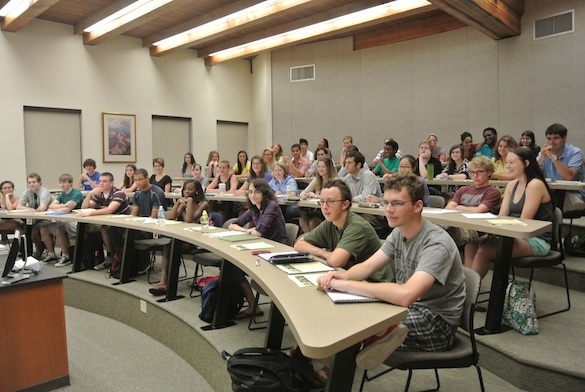 By their senior years these same students will feel like veteran speakers and masters of their topics. As juniors, though, the task is daunting. The faculty make the proceedings a little less formal than the senior presentations (note in the photo above Anna Mudd is giving her talk on paleosols from a cart as a podium! ), but our juniors are still facing a group of their peers … and scary faculty charged with evaluating their performances. The students came through this year and did very well. New to the system this year were posters from the Utah group (explained below). 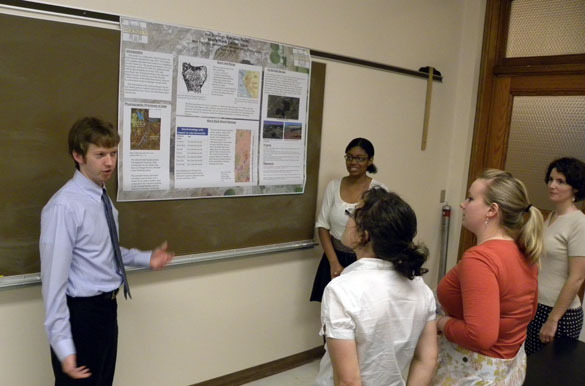 Each of these four students still gave an oral presentation, but rather than all repeating the same basic framework information (location, geological setting, etc. ), they began their set of talks with these poster discussions. Above we see Kevin Silver starting to explain the Utah integrated projects, with Whitney Sims ready to do her part at the end. Will Cary will be looking at the ballistics of volcanic bombs thrown from the eruptions. Whitney Sims will examine the petrology and geochemistry of particular lava flows. Kevin Silver is studying xenoliths in these lava flows. Matt Peppers will be doing a fracture analysis of the Ice Springs lava flow. 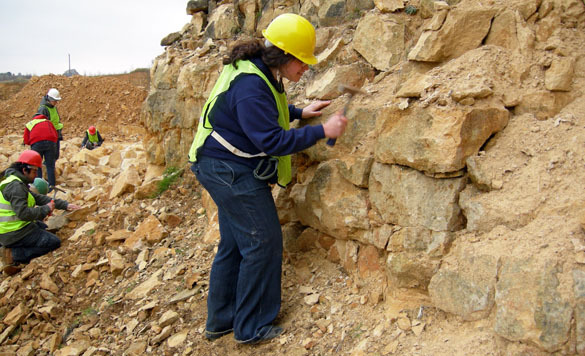 Anna Mudd is examining paleosols (ancient soils) developed in the northeastern Oregon. Joe Wilch is assessing metamorphic core complexes in the northern Snake Range of Nevada. Richa Ekka will concentrate on petrology and paleoenvironments of Silurian carbonates. 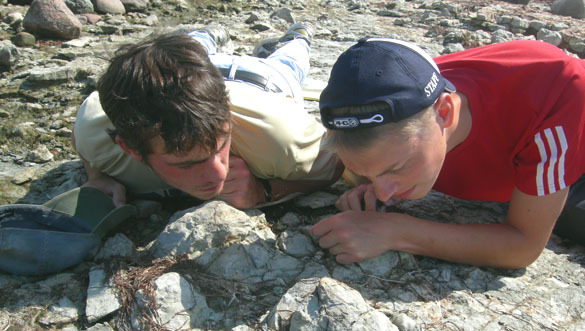 Jonah Novek will study Silurian paleocommunities and recovery faunas. Jenn Horton and Lauren Vargo will study the reaction of trees (and their rings) to climate change and isostatic rebound. 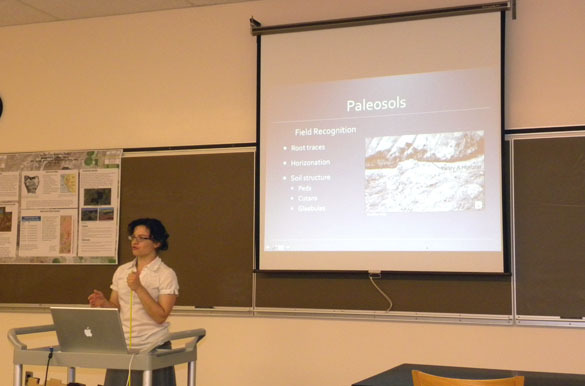 Melissa Torma is studying Jurassic faunas in Israel with Dr. Wilson. Kit Price will be examining Ordovician sclerobionts in the Cincinnati region, also with Dr. Wilson. This summer you will see blog posts from all of the above as they start their senior adventures! 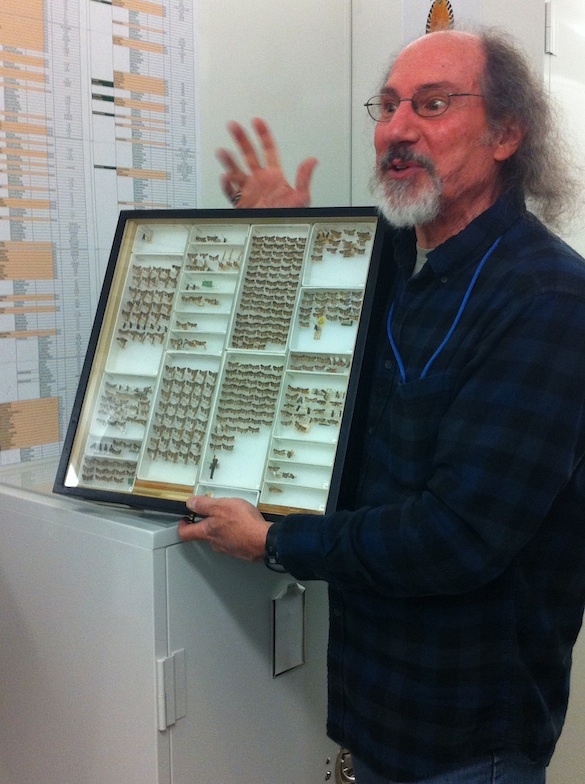 This is what it took to name a new species in 1824! Since then, of course, we have a detailed set of rules for naming animal taxa detailed in the International Code of Zoological Nomenclature. The Lawrence (1991) reference below is an example of what we often have to do in order to bring old names like “Ostrea Gigantissima” up to, well, Code. The interior of the attaching valve of Crassostrea gigantissima. The top surface of our giant oyster is riddled with these small holes. 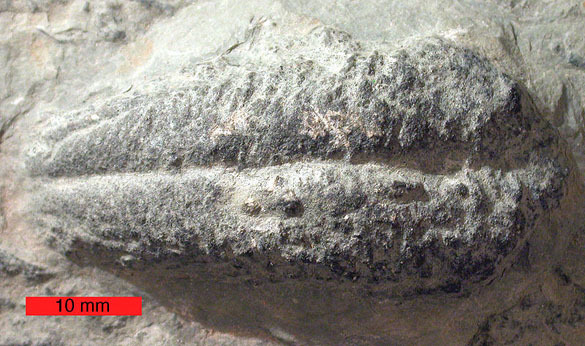 They are produced by the boring sponge Entobia, which is the next Fossil of the Week. Finch, J. 1824. Geological essay on the Tertiary Formations in America. The American Journal of Science and Arts 7: 31-42. 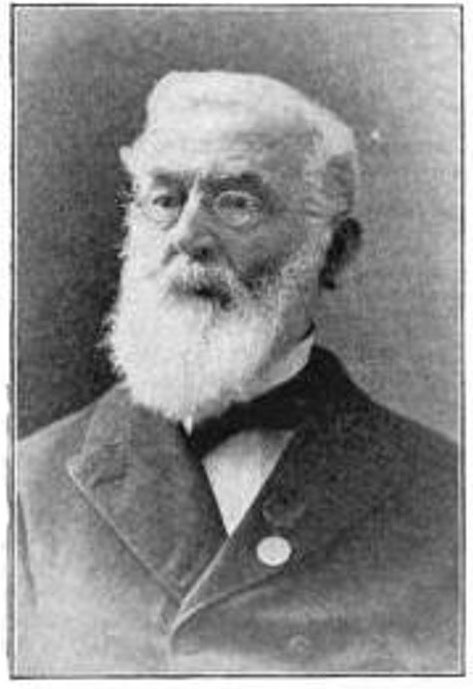 Howe, H.V. 1937. 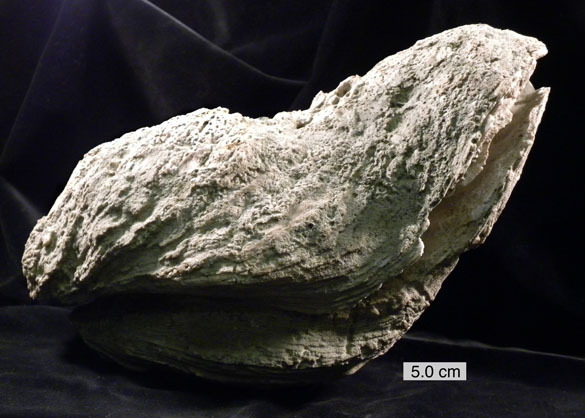 Large oysters from the Gulf Coast Tertiary. Journal of Paleontology 11: 355-366. Lawrence, D.R. 1991. The neotype of Crassostrea gigantissima (Finch, 1824). Journal of Paleontology 65: 342-343.